This aircraft is Russia's answer to the F-22. The F-22 program was killed by the DOD earlier this year in favor of the Joint Strike Fighter program (F-35). From the video, this appears to be one hot aircraft. According to Fox News "Putin said Friday the first batch of new fighters is set to enter an air force evaluation unit in 2013 and serial production is set to begin in 2015." Hat Tip to Lt. Col. Mark Rose for this. Robert Gibbs decided to discuss executing KSM, before even the venue of the trial has been finally decided. I agree that KSM should be executed. However, my opinion is that this should have been handled by the military and the military tribunal process. Unfortunately, some hot shot defense attorney is going to get up on appeal and point to Gibbs' statement and say that the trial was not fair-- the outcome was pre-determined. Of course, the defense attorney is also going to scream that the trial was unfair because of "pre-trial publicity." All in all, I really wonder if a conviction will stand. There are too many loopholes (as there should be) in civilian law. Civilian law should never apply to any enemy combatant. I am so glad we have a Constitutional Lawyer in the Whitehouse to make sure that terrorists' "rights" are being preserved. In the latest revelation about the "accuracy" of the "overwhelming scientific evidence," the Telegraph has uncovered that the International Panel on Climate Change (IPCC) used a student paper and a magazine article containing interviews with mountain climbers as sources for evidence of ManBearPig global warming in its 2007 report. Neither "source" was peer reviewed. In its most recent report, it stated that observed reductions in mountain ice in the Andes, Alps and Africa was being caused by global warming, citing two papers as the source of the information. However, it can be revealed that one of the sources quoted was a feature article published in a popular magazine for climbers which was based on anecdotal evidence from mountaineers about the changes they were witnessing on the mountainsides around them. So much for the "overwhelming scientific evidence." We have heard the GOP response to the State of the Union, and we have heard the pundits response to the State of the Union, but now it is time to hear the Voters response to the State of the Union. Barry Obama was right about one thing in the State of the Union. "We face a deficit of trust -- deep and corrosive doubts about how Washington works that have been growing for years." 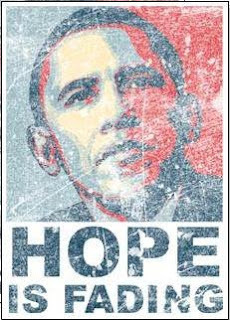 The problem for Obama is that He is the one that voters do not trust. According to Rassmussen there are a large percentage of voters who do not trust or believe what Obama said in the State of the Union. I guess there really is reason for hope! When the President stated that taxes have been cut for 95% of Americans, he told the GOP side of the isle "I thought I'd get some applause on that one." There was laughter at the comment, but not just from inside the House chamber, there was laughter in American homes. Only 21% of voters believe Obama's statement. 53% say it is definitely not true and the rest are not sure. Only 35% of voters believe that the stimulus package has helped the economy. A vast majority (59%) of voters also think that the best way to create jobs is to CUT taxes-- but only 14% think that Congress will actually listen-- go figure. Although Obama said his health care plan will lower the deficit, 68% of voters think it will raise the deficit and 81% believe that it will raise "middle class" taxes. Most voters also say that the health care plan before Congress should be dropped. But Obama doesn't get it... maybe that is why 61% of voters think it is at least "somewhat likely" that the GOP will take back the House this November. Perhaps Barry Obama just needs to be "explaining it more clearly"... After all, we are just the stupid voters who are only concerned about "what's in it for me." Or at least that is what our President thinks. Obviously, Obama is a bit out of touch with what the American Voters think. In the Well of Senate, Sen. Mitch McConnell attempted to set the record straight on the Citzen's United. Again, it amazes me on just how wrong the "Constitutional Law Professor" that sits in the Oval Office can be-- but I will let Sen. McConnell speak for himself. Bin Laden joins Obama in Blaming Bush-- On Global Warming?? Now, I have a question here-- Wouldn't crashing 767's and 757's full of fuel into buildings increase carbon dioxide in the atmosphere??? For someone concerned about ManBearPig global warming wouldn't this be a bad thing??? Obama did say "I know that there are those who disagree with the overwhelming scientific evidence on [ManBearPig]climate change." I am one of them. I guess Bin Laden is not. I think that the point also needs to be made that there have been many people over the years who have disagreed with the "overwhelming scientific evidence" of the day... Galileo was one, and so was Copernicus. According to the NY Daily News, the White House has finally heard the chorus of people stating "keep the terrorists out of NYC." Of course, the biggest problem is that they are still saying they want a civilian trial. Just moving the KSM trial out of NYC is not enough. The KSM trial needs to be moved back to military jurisdiction. Unfortunately, the military charges were dropped against the terrorists, so I am am curious if there would be a jeprody issue. Of course, civilian charges have not be leveled either... so right now, KSM and his budies have not been charged with anything anywhere. After spending his State of the Union talking about how important education is, it looks like President Obama will kill off a government program that is 100% about discovery, education, learning and exploration. It appears the White House will zero out the Constellation Program at NASA. Instead, NASA will be directed to have "other governments" - namely the Russians- fly our Astronauts to the space station. 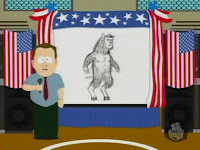 NASA's mission will be to stop ManBearPig Global Warming. Apparently the President does not realize that the best way to stop ManBearPig Global Warming, is to get scientists to report factual data, instead of making up numbers to create a fictional crisis. Ending manned exploration of space will hurt every American. Since 1976, NASA's manned exploration of space has provided over 1400 inventions that affect our daily lives. These inventions include everything from medical scanners to self contained breathing apparatus (SCBA's) used by fire-fighters to save lives. Smoke detectors (originally deployed in Sky Lab) and ear thermometers are other examples of how NASA "tech" has filtered down to every day lives. Yes, the United States is in a recession. However, our manned space exploration program does not need to be ended because of it. The history of mankind is the history of discovery. We have been leaders in discovery for over the past 100 years or more. We must not give it up now. I have never heard or seen anything like this before. "Last week, the Supreme Court reversed a century of law to open the floodgates for special interests - including foreign companies - to spend without limit in our elections. Well I don’t think American elections should be bankrolled by America’s most powerful interests, and worse, by foreign entities. They should be decided by the American people, and that’s why I’m urging Democrats and Republicans to pass a bill that helps to right this wrong." The amazing thing was actually seeing Justice Alito shake his head and mouth "not true" as the President was speaking. The Chief Justice appears to be shaking his head as well. Juan Williams on Fox News: "I am not sure it is appropriate for the President to scold the Supreme Court...it worries me in terms of intimidating a branch of government." Now, I personally am not sure that the "Supremes" were intimidated-- but Justice Alito certainly looked angry. I have been looking and I cannot find another instance where a President has publicly rebuked the Supreme Court to their "faces." I believe the President failed to remember that the Supreme Court is an Equal Branch of office. They hold office for life, and they do not report to the Executive Branch. Tonight, the President fulfills one of his Constitutionally required duties that were set forth by the Founding Fathers, although I doubt the Founding Fathers ever envisioned the show we will see tonight. I began to think about why the Founding Fathers thought that this task was so important that it be spelled out. Looking back, to the days without instant global communication, when news travelled slowly if at all, individual Congressmen may not know what was happening outside their state or District. The Office of the President however, would be perceived to be one that would be a clearinghouse of information and that He would know the actual "state" of the Union. Now I am not so naive as to think that politics did not enter into the thoughts of the Founding Fathers, but I would like to think, that perhaps in an era without "instant dial" focus groups, live television, the internet and dare I say "bloggers," perhaps the State of the Union was a bit more of a factual event and less of a show. It has been a year since the Obama Administration and the Democratic Party took a 'super-majority' control of the Congress and the White House. Liberals have had control of the agenda, from what laws and budget are proposed to the sixty votes in the Senate that can break any filibuster to the signature of the President. Liberals have had the power to provide 'change' and Fiscal policy has been under control of the Democrats . Yet things are worse now then they were last year and tonight, in this State of the Union, the Republicans and Bush will be blamed. Over the last year, the Democrats in Congress and the Office of the President have sought to stimulate the economy. As such, your Government is spending $862 billion of the peoples money and watching unemployment increase to 10%. This recession began in January of 2007 under a REPUBLICAN and during the TWO YEARS between January 2007 and January 2009, Unemployment increased from 5.0% to 7.6%. This is a 2.6% increase in unemployment over TWO YEARS of Republicans. However, under Democratic control, from January 2009 until December 2009 unemployment has increased to 10%. This shows an unemployment increase of 2.4% in only 11 months! But for this, the Republicans must be blamed. The Administration must squash business with Cap and Trade. This, despite increasing evidence that ManBearPig the theory of Man Made Global Warming is a fraud. And in the business surrounding science, this administration, should commit itself to achieving the goal, before this decade is out of destroying as many current science and technology jobs as possible and kill America's drive for the stars, its history of discovery and the countless jobs, products, and inventions that our exploration of space as brought us. During this last year, this administration has embarrassed this country in foreign relations. In giving the Prime Minister of Great Britain a set of DVD's and the Queen an iPod containing "the best of Obama" to isolating Israel, the Administration has snubbed our greatest allies. Advisors, such as Brezinski have suggested military attacks on those we call friends. Yet through this, this Administration has sought to provide the rights of American Citizens to those that seek to kill us, and this Administration will make sure that the terrorists of Al Qaeda receive a Civilian trial instead of the War Crimes trial they deserve. However- it was Bush who lied and started all of this and this is all the Republicans fault. Let it not be said that this administration has not tried to spread socialism. But for this Conservative from Massachusetts, socialized medicine would be a done deal. Again, this is the fault of a Republican who dared to say he would oppose the Health Care bill as it is now and duped the people into believing him. The American people need change, just not the change they say the want. How can 48% want a new President, while only 43% say they would re-elect the Messiah? Rush Limbaugh, George Bush, Hannity, Beck, Scott Brown and the Republicans are REALLY the ones to blame as are the American people. This administration only wishes to force on its citizens what liberals know to be best, despite what the people want or what is stated in the Constitution. In this next year, although this Administration will say IT will change, rest assurred, it is only to get re-elected. This administration shall stay dedicated to its knowledge that IT knows better than the American people and that this Administration shall decide what is best for you and more importantly what is best for us to maintain control. Va. Man Arrested on Weapons Charges- Possible Terrorist or Tourist? A Virginia man was arrested in New Jersey on weapons charges after police found him with a pair of Bushmaster rifles (one in .50 -apparently altered- and one in .308), a 37mm grenade launcher, several hundred rounds of ammo, a pair of bullet resistant vests, a Russian night vision scope, a red and white "middle-eastern" headdress, and a map of Fort Drum. The FBI is saying there is no known specific link from this man to terrorist or to a terrorist plot, but, with the grenade launcher, the night vision scope and a map of Fort Drum, one has to wonder. Of course, this guy was visiting New Jersey-- perhaps the weapons were all for self defense? 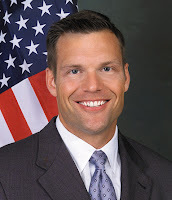 Dr. Kris Kobach is running for Secretary of State for the State of Kansas. Dr. Kobach is a professor of Constitutional Law, former White House Fellow, past Chair of the Kansas GOP and a regular contributor on O'Reilly and Lou Dobbs. Kris also spends his time fighting against the over-reaching of the ACLU. With Kris as Secretary of State, Kansans can rest assured that he will be doing everything possible to make sure that at least in Kansas, the illegal voter operations of groups like ACORN will stop- and that only those that have the right to vote, get to vote. Kris takes a firm stance against illegal immigration. Most recently, he has taken the case of Nebraska students who are required to pay out-of-state tuition while illegal aliens are allowed to pay in-state tuition. Of course, the liberals of the "CommunistKansas City Star" (I hate linking to and giving "idiotic" statements traffic, but I must site sources) are basically accusing Kris of all sorts of racism and all manner of evil. Apparently, illegal aliens who are over 18 should be given a free pass and be allowed to pay "resident" tuition while legal immigrants are required to pay "non-resident" tuition. I fail to understand why a person who is in this country ILLEGALLY should receive special discounts, while people who obey the rules are required to pay full price. I also fail to understand why those of us who disagree with illegal immigration are constantly accused of racism. In case liberals where not aware, according to the Border Patrol 2008 Performance and Accountability Report, "in FY 2008, the Border Patrol apprehended 51,970 illegal OTM [other than Mexican] aliens at the southwest border and 3,681 OTMs along the northern border." Illegal aliens come from all races and colors. Illegal immigration has NOTHING to do with any one race. Michelle Malkin mentions Kris in her book "Culture of Corruption"
It has been almost a year since my last post. Why? Well, for just about the last two years I have been on a "contract for hire." Unfortunately, I became aware that the company (that I will not name) that I was contracting for appeared to have views on the Second Amendment that were quite different than mine, and at the time the contract started, one of the guys I was working with said, "I 'googled' your name and found your blog..." Although this person happened to agree with me politically, I began to worry about how the things I was saying may impact my contract. Long story short, I am being laid-off as of Friday (29 January 2010), so I guess "holding my tongue" (or my keyboard in this case) really did not matter. I am still fighting with psoriatic-arthritis. I am now on Remicade and Methotrexate, so I am sure there will be days where writing may not be possible, but I shall do my best. I look forward to writing and hope to see my readers return. As always, comments are welcome- as long as they are NOT anonymous.